Keep your concrete driveway clean with these 4 simple steps! There is a reasonable chance of removing small relatively new oil stains with hot water, detergent and a steel brush. Simply apply the detergent and scrub with a steel brush, clean with water then repeat if necessary. However, if your stains are well worn and larger you will need to purchase a degreaser. There are powerful, concentrated, cleaners that can remove ingrained dirt, grease and oil deposits and most automotive fluids without damaging the surface. These can be easily purchased from your local hardware store. 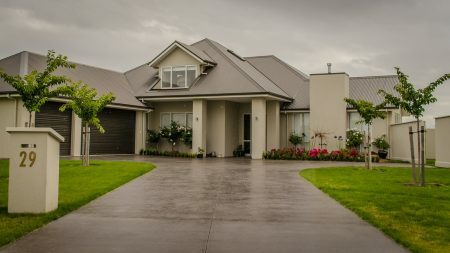 How often your concrete driveway needs to be cleaned primarily depends on the amount of traffic it receives and what type of vehicles are parked on it. Obviously, any fluid leaks should be cleaned up immediately because they can seep into the concrete and discolor it and break it down from the bottom up. Water blasting concrete to remove fungus, moss and lichen growths will damage the surface by stripping away the cement and sand, leaving a rougher and more porous surface. Instead, look for a concrete cleaning product that kills lichen and other moss without stripping the integrity of your concrete driveway. These products can usually be attached to your garden hose and sprayed on gently. Generally, you should reseal a concrete driveway every two years or so, or when the finish begins to show wear. Good commercial sealers are available from concrete material suppliers and hardware stores. Always apply the sealer according to the manufacturer’s recommendations and be sure to ask for advice if your are unsure which type your require. The typical residential driveway isn’t engineered to support heavy vehicles (like a huge moving van) and large construction equipment. Further, the way in which you care for a driveway will differ depending on the type of concrete driveway you have. Plain and/or textured concrete driveways will require regular washing. Keep the surface free of debris by sweeping it with a broom or leaf blower or rinsing with a garden hose. Although water alone can remove dirt from concrete, cleaning chemicals followed by power washing and scrubbing may be needed to remove tough stains. Stamped or engraved concrete driveways may require extra protection in the form of waxes and polishes. Stamped interior floors that are subject to lots of foot traffic will benefit from the application of a sacrificial floor wax or polish which will protect the sealer. Your concrete floor or driveway is an investment in the future value of your home and should be cared for as such. Though built to last, you will only get as many years out of it as you allow for with regular maintenance and cleaning. Make yours last a lifetime.